Single parenting is tough. Tough. Tough. Tough! (Notice, ladies, that I didn't write, "Single father parenting is tough?") Still, I'm a single father and this is The Single Father's Guide Blog, so take that any way you want to. As I've already written here, for a single parent whose former partner is no longer in the picture, i.e., the single father who is a widower or a widow, whose partner is physically or emotionally incapacitated, or whose partner is simply non-existent by her own volition, he is on-duty 24 hours a day, 7 days a week, 365 days a year. Single parenting can be more than overwhelming. The "more than overwhelming" category is where I found myself recently. Between the stresses of parenting two teenage daughters in the hormonal throes of staking their independence, a needy nine-year old son, navigating a complex romantic relationship, enduring a remodeling of my kitchen - living without a kitchen, managing finances, planning meals, making sure everyone is where the need to be when they need to be there, and balancing all of that with my own personal needs, well, I recently found myself near the edge. As Kurt Vonnegut wrote in his novel Player Piano, "Out on the edge you see all kinds of things you can't see from the center,” I was frankly a little concerned about going over. I really needed a break. What I appreciate about a good friend is he (or she) is there when you need them. I'm originally from Missouri and, while many of my closest friends still live in the Midwest, I've made a lot of great friends as I and my late wife, Lori, moved around the Northeast with my job. One of those friends was Lauren Dubuc. I met Lauren when she interviewed for a job at Ferrellgas in Rhode Island. At the time, I was overseeing three locations for the national, Missouri-based distributor of propane and I was trying to find a strong player to strengthen the office team. I offered Lauren a position that she wanted, but for some reason, it took me about a month to convince her to take the job. From there, I knew my relationship with Lauren would be unique. Eventually, Lauren got married and I became friends with her husband Mike and, later, with her parents Gerry and Ed Perry. Mike and I played golf regularly, Lori and I enjoyed a couple of holidays with the at Gerry and Ed's house, and we even made a couple of trips to the house Lauren's family had on Martha's Vineyard. While Lauren and I spoke a couple of times a year, her life and my life no longer intersected. I hadn't seen her since Lori's wake in 2005. Still, she wasn't terribly surprised to hear from me when I called her early on a Friday afternoon and said, "Lauren, I'm having a really hard time. Can you help?" After she heard my story, Lauren didn't hesitate. "We took the slip covers off of the furniture last time we were there to have them cleaned, but if you can handle the sheets covering the sofas and chairs in the family room, you can have the house for as long as you want it." By "the house," Lauren meant her house on Martha's Vineyard. The Favorite Son's school had an early dismissal, so while he and I hit baseballs at the batting cages, I waited for his sisters to get home. The First Beautiful Daughter had gone directly to a local cafe with her, ahem, boyfriend. When she came home at about 3:30 p.m., she told me that she didn't want to come because she had plans for the weekend and she was scheduled to work as the birthday party coordinator at Sports Fitness & Fun on Sunday. Ironically, I made the very same decision during the early Eighties when I was 16 years old and my family vacationed at Fox Springs, a Missouri Ozarks resort. She made arrangements to stay with a friend for the weekend. The Second Beautiful Daughter responded, "Martha's Vineyard!?! Can I bring a friend?" We, including The Favorite Son, The Second Beautiful Daughter, and her friend Shannon, were on the road at 4:45 p.m. when I called Lauren again to tell her it was a "go." I asked her if she knew the launch time for the last ferry from Wood's Hole and she said, "9:45 p.m." My GPS indicated that our anticipated arrival to Wood's Hole, Massachusetts was 9:46 p.m. with no stops. I was a little concerned. As it turned out, road construction traffic in Danbury cost 15 minutes, but I made up time near Hartford and on I-495 south of I-90 where the GPS calculated trip time based on a 50 mile per hour speed limit where, in fact, the speed limit was 65 miles per hour. So, miraculously, we arrived without a reservation at Woods Hole at 9:31 p.m., which gave me just enough time to get our ferry tickets and drive on. As it turned out, we didn't need a reservation. There was plenty of space on the car and truck level. Whew! The kids, particularly The Favorite Son enjoyed the ferry ride. We were on and off the observation deck four or five times. By the time we docked in Vineyard Haven, it must have been a quarter after ten. Even though Lauren's house is perhaps ten minutes from the ferry dock, it took me a half an hour to get to the house. 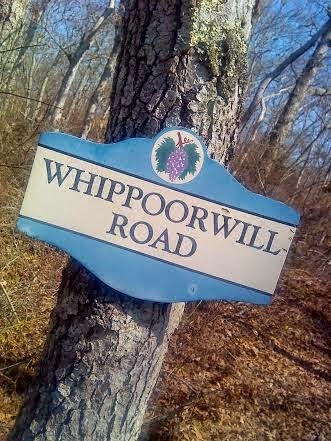 On an island where it's customary to either name driveways with charming names like Whippoorwill Road and Pepperbush Drive or mark property with a picture of a flower. 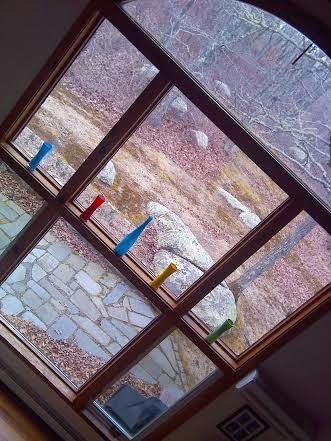 Lauren's house is marked with a periwinkle, which is a little play on Lauren's maiden name, "Perry." It's hard to see much in the Vineyard night, especially on the little dirt road drives through thick woods and brush that comprise many of the secondary roads in Chilmark, which is near the center of the Vineyard. So, at nearly eleven o'clock after more than six hours of travel, we found Lauren's house. Incredibly, Lauren had called ahead to her caretaker and asked to have the house "turned on" before we arrived, so lights were on, the furnace had already heated the house, the water was hot, and the beds were even made. I called Lauren one more time to thank her for her thoughtfulness and, as always, she graciously deflected my appreciation with, "You know we're friends, Tom." 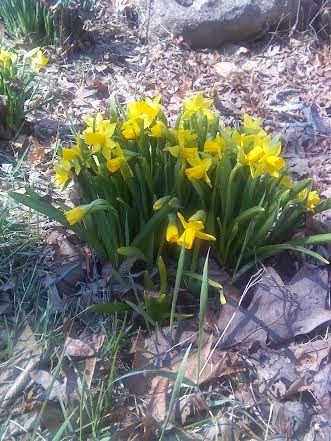 While the kids and I unpacked the car and put the groceries from my refrigerator and freezer I hurriedly tossed into a cooler and reusable shopping bag before I'd left home, I saw in the floodlights' range a patch of daffodil stems had pushed up from their winter sleep. Then, I made a snack as everyone was settled. In Lauren's family's three-bedroom contemporary, situated about as far from a beach as it could be on Martha's Vineyard, the girls took the upstairs room that included two twin beds. I grabbed the upstairs king. 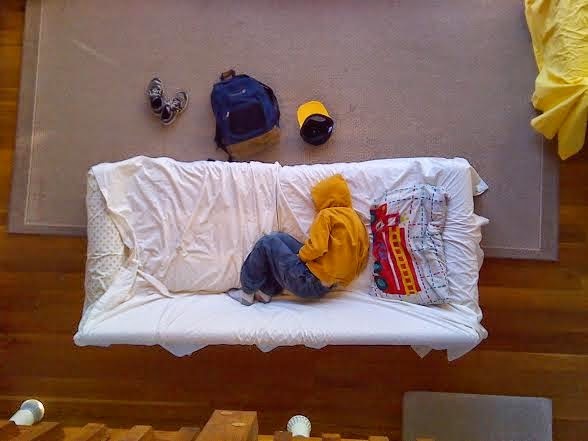 I expected The Favorite Son to sleep in the first floor queen, but he opted for the sofa, instead. Unpacked and settled, the four of us watched television for a while. I enjoyed a single adult beverage before heading upstairs to a made bed. I enjoyed more than nine uninterrupted hours of sleep. It is truly a blessing to have friends the likes of Lauren, to whom I say "thank you" for giving the Favorite (and over-stressed) Father and family a place to get away and unwind. And that is a great picture and caption of the Favorite Son.